SAGITA COM - sagitasoft.com - CyberLink YouPaint 1.5 Portable adalah menyenangkan-dikemas sentuhan aplikasi untuk melukis pada PC. Alat yang tersedia adalah kuas, pena, palet warna, stamps, tracing paper, image blooms, dan banyak lagi, menyediakan hiburan yang kreatif. CyberLink YouPaint 1.5 Portable membuat antar muka baru bagi pengguna platform multi touch dan tablet pena, yang memungkinkan lukisan realistik dengan tangan dan pena. Select from one of four drawing tools—chalk, pencil, marker, or crayon—and adjust the tool size to suit your project and the effect you are trying to create. YouPaint drawing software provides the feeling of actual texture when using various drawing tools. What's better than a box of 5 colored pencils? A box of 60, of course! YouPaint drawing and painting software offers a choice of 60 vibrant colors to work with. Adjust the size of each tool with the sliding scale to create colorful lines of various thickness. By supporting the latest touch hardware and the multi-touch features of Windows 7, you and your kids can enjoy touch applications as you can draw and paint directly on the screen with your fingers. Of course, with YouPaint painting software you can not only enjoy touch applications but you can also use a pen tablet or mouse. 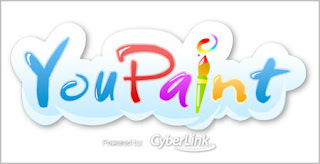 YouPaint painting software lets you use the painting tool or paint bucket and color palette to create vibrant paintings from the fun coloring pages. And if you're not happy with the result, you don't have to throw it away - just erase it all and start again! Image blooms work like a quick copy and paste tool, repeating a series of the same image. Create a swirling chain-like effect from a choice of 13 types of images. You can apply anywhere on the canvas or make stunning borders, it’s your art work! View and save all your drawings and imported images in the art works library. Print your work by choosing from one of four pre-defined styles—portrait, landscape, color or grayscale. And now you can even email your masterpiece directly from YouPaint drawing software.